What Are the Functions of a Grasshopper's Compound Eyes? The vision of grasshoppers is markedly different from that of human beings -- and from many other organisms, for that matter. The insects are equipped with five eyes in total, three of which are simple eyes and two of which are compound. The sizable compound eyes are situated on the sides of their heads, while the other eyes are directly between them. Compound eyes consist of ommatidia in the thousands -- divisions that are all equipped with lens. These lenses are all hexagonal in outline. These ommatidia -- or miniature eyes -- are situated in tight and dense masses. They all take in small portions of light from the full image that a grasshopper is observing. Once all of these individual "shots" make their way over to the grasshopper's brain, they merge into one big picture. Grasshoppers' compound eyes function not only to pick up on motion and basic form, but also to discern the distance between their bodies and other things -- perhaps sources of food, for example. 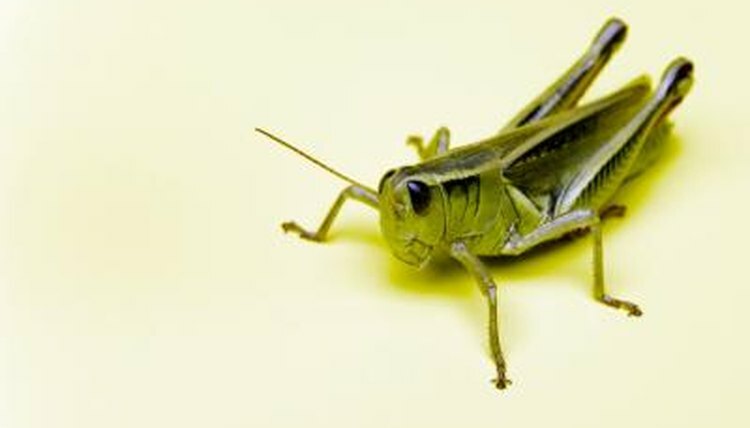 Grasshoppers' eyes are not capable of moving like those of humans. Their compound eyes' ommatidia are useful in that they all look off into different directions, all of which work together to illustrate extensive images -- not only from the front, but also from the backs and sides. They operate, essentially, in order to stop grasshoppers from having to rotate their heads all the time. Without compound eyes, a poor grasshopper couldn't know whether something was moving or totally still. The grasshopper's simple eyes are also referred to as the "ocelli." These eyes are nowhere near as complex as the compound eyes. For instance, they are completely free of ommatidia. They only have the means to differentiate between dark and light -- something the compound eyes cannot discern. If you ever see a grasshopper's face up close, you might notice the compound eyes have circular general outlines. Despite that, some grasshoppers' compound eyes are actually more egg-shaped, especially if they have particularly sloping heads. Do Flatworms Have a Brain?